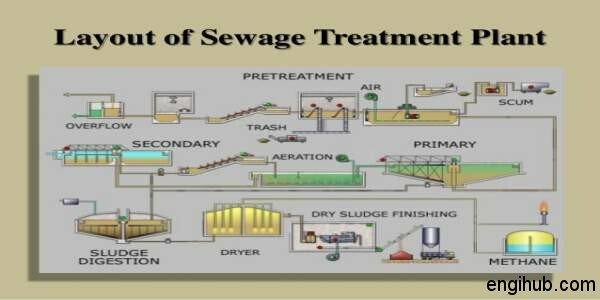 In water engineering, the treatment of sewage is an essential part of leaving the wastewater to river or sea. To safeguard our water sources it is most important to treat the domestic or industrial waste. More ever this treated sewage can be reused for the irrigation of a golf course, green way or park. 01) Primary treatment consists of temporarily holding the sewage in a quiescent basin. Where heavy solids can settle to the bottom while oil, grease and lighter solids float to the surface. The settled and floating materials are removed and the remaining liquid may be discharged or subjected to secondary treatment. 02) Secondary treatment removes dissolved and suspended biological matter. Secondary treatment may require a separation process to remove the micro-organisms from the treated water prior to discharge or tertiary treatment. 03) Tertiary treatment may call as sewage polishing. Treated water is sometimes disinfected chemically or physically (for example by lagoons and microfiltration) prior to discharge into a stream, river, bay, lagoon. Pre-treatment removes materials that can be easily collected from the raw wastewater before they damage or clog the pumps and skimmers of primary treatment clarifiers (trash, tree limbs, leaves, etc). The influent sewage water has to remove all large objects carried in the sewage stream. In modern plants, automated mechanically raked bar screens are used. In smaller or less modern plants a manually cleaned screen may be used. The solids are collected and later disposed in a landfill or incinerated. A considerable amount of grit is carried along with the flow and these pose problems in most sewage systems. Grit particles are of large size and have a high density when compared with the organic particles in sewage. With a retention time of 30-60 seconds, the flow of sewage through a channel of sufficient length can allow the settling of grit particles at the bottom. While the remaining suspended solids continue to flow through the channel. The settled grit is removed at intervals, washed and then disposed of. Other types of grit removal employ a short retention settling tank. Sand filtration removes much of the residual suspended matter. Filtration over activated carbon removes residual toxins. What is mean by Lagoon? A lagoon provides settlement and further biological improvement through storage in large man-made ponds or lagoons. Constructed wetlands include engineered reed beds and a range of similar methodologies, all of which provide a high degree of aerobic biological improvement and can often be used instead of secondary treatment for small communities.